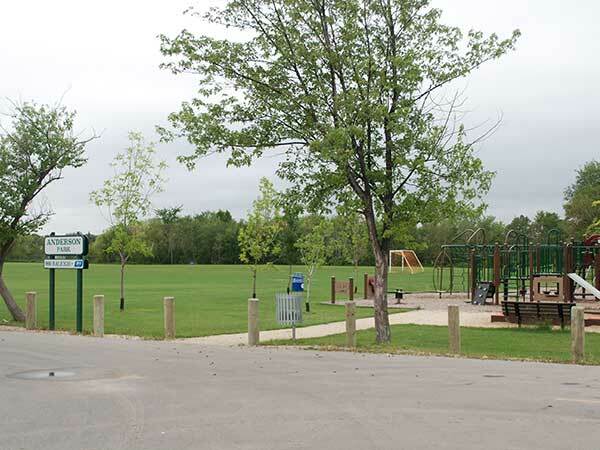 Opened in July of of 1972, a six-acre section of green space in East Kildonan was named for horticulturist Edwin Alexander Anderson. An official opening ceremony was held in August with attendees including Councillor Alf Penner, Speaker of the Legislature Peter Fox, and River East Mennonite Brethren Church Reverend E. A. Isaacs. A plaque was originally mounted on a boulder within the park but following an expansion to the parking lot in 2014, it was removed from its base, relocated, and mounted on the outside wall of park clubhouse. The park initially contained two soccer pitches and a play structure, though would later include a football field, floodlights, and stands hosting the East Side Eagles Football Club. The football club relocated to facilities at Kildonan East Collegiate in 1994, and the football elements have since been removed. The park now features a playground and several soccer pitches. “Park name honors long-time resident,” [Newspaper clipping], August 1972. Jim Smith / MMC Alumni. “Expansion sidelined,” Winnipeg Free Press Weekly, 2 April 1989 Northeast Edition, page 1. “The Eagles have landed a field,” Winnipeg Free Press, 22 June 1993, page B4.